It looks like Google is withdrawing from direct competition with Skype for the VoIP market by including it in Google Pack, a package of "essential" software from antivirus to browsers. 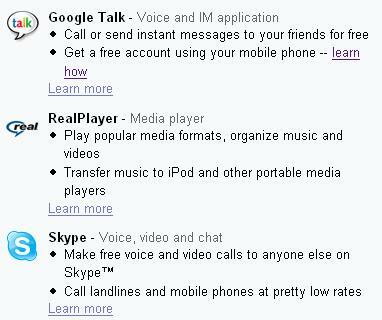 From the looks of the descriptions of Google Talk and Skype above, Google Talk is positioned as an IM client primarily while Skype is positioned as a voice and video calling program. While the IM market is much more mature, Skype has dominated the VoIP with little significant competition. Maybe Google recognizes the futility of competing on a direct basis with such entrenched competition and is looking to go after rival Microsoft's Messenger IM client.